Politicians and voters often hearken back to the golden and pure political age of the Founders. The reality is that political disputes were extremely vicious back then and the Adams administration went as far as implementing Sedition Acts to muzzle dissent. The man touted as the apostle of limited government and states rights would ban American ships from engaging in foreign trade. Likewise election campaigns (notably the election of 1800) were outright nasty with verbiage that would be unthinkable today. To prove this point, the folks at Reason came up with the clip below using the verbiage published by Adams and Jefferson supporters in their Presidential rematch. Enjoy. Just for kicks, included below are two classic negative ads from 1964 and 1968. Personally I don’t care about politicians who stray from time to time. I draw the line at moral hypocrites who wrap themselves in the flag of family values and further with no hint of irony co-sponsor legislation to protect the sanctity of marriage. Likewise after the news of his involvement in the prostitution ring broke a few years ago his hypocritical fellow Senators from the self proclaimed “family values” party welcomed Vitter back with a standing ovation. But then if frogs had wings their butts wouldn’t be so sore. 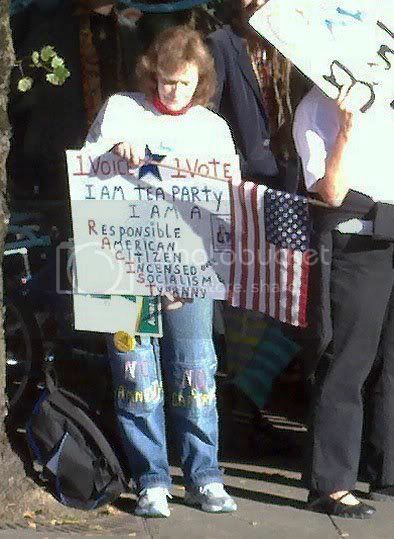 We are after all talking about the Democrats whose spines are made of jelly. Rather than boldly standing behind the popular portions of the law, you have people like Joe Manchin who cravenly flipped their positions for short term electoral prospects. With Democrats unable or unwilling to tout their accomplishments during the Obama presidency, it is no wonder that the enthusiasm gap came into being. However, undesirable the ultimate end result I will shed no tears when some of these gutless wonders (e.g. Blanche Lincoln and an assortment of Blue Dog Democrats) lose. Why is the individual healthcare mandate unconstitutional? Because it was passed by a Democratic president. Ezra Klein notes the history of Republican Senators who had no problem with a health care mandate in the past and actually sponsored legislation containing one This has been one of the tragedies of the health care debate. Barack Obama passed a bill that Bill Clinton could have passed in 1993 with the blessings of the Republicans in Congress. But today that is portrayed as a socialistic power grab, even though it did not contain the public option that most of the left and a majority of the country wanted. The question now is whether the conservatives on the Roberts court will have a similar change of heart. This is just embarrassing. President Obama during his visit to India will be skipping a trip to the Golden Temple in Amritsar. The Sikh shrine is a common stop for visiting dignitaries. Unfortunately it requires visitors to cover their heads. Sikhs have already been targeted by ignorant bigots in the past who confuse their turbans with the headgear worn by Osama Bin Laden, and evidently in this country any such covering is Islamic. Singed by a previous controversy during the presidential primaries when pictures of him wearing traditional garb during a trip to Africa surfaced, the Obama administration is shying clear of any repeat performance. The underlying politics are simple. With increasing numbers of Republicans convinced that he is a Muslim and significant numbers doubting his citizenship, the administration wants to avoid adding grist to the nutjob’s mills. While discretion may sometimes be the better part of valor, I am disappointed with this decision. In an atmosphere of anti-Islamic bigotry ginned up over the summer by the likes of Newt Gingrich and Sarah Palin (and more recently with Islamophobic statements uttered by prominent Fox “News” personalities and bigots like Marty Peretz with no repercussions), the administration could have taken a bold stand for tolerance and common sense. But instead we have an American President afraid to go into a Sikh shrine because ignorant bigots in his country will use it as further evidence that he is a Muslim – and thereby also lending credence to the viewpoint that somehow it is wrong to be a Muslim in American public life. Here’s hoping that it is not too late to reverse this decision. It has been very frustrating in the last year to listen to former Obama supporters complain that “he has not done anything.” Faced with the worst economic condition for an incoming president since FDR, two wars, an opposition committed to voting no on any administration proposal and blocking many nominees (who later somehow get confirmed almost unanimously) and a wing of his own party paralyzed by timidity, Obama did not possess a magic wand to clean up the mess he inherited. He could have easily lapsed into Bill Clinton style incrementalism, but did not. My biggest complaints against him are (1) the opportunities squandered in pursuit of bipartisan compromise with an opposition united in lockstep truculence and expecting Obama to pass only their version of legislation (even though they lost the last two election cycles), and (2) his failure to clean up the excesses of the Bush administration’s tactics in the war on terror, where he has provided soothing rhetoric but little substance. And yet in 2 years Obama has a litany of legislative accomplishments that dwarf his predecessors. While the extreme left is disappointed in the health-care bill, Obama is the first president to actually get such comprehensive legislation through. I will not make an exhaustive list of his accomplishments, because I don’t have to. I recommend reading this article from Tim Dickinson at the Rolling Stone which lays them out. I will harp on one accomplishment that has not got the press it deserves, and is noted in Dickinson’s article. Passed with universal opposition from the Republican Party and to the disgust of libertarians of the Chicago school, Obama did what Reagan also did in the early 1980’s. He bailed out Detroit. The bailout prevented the cascading job losses in the Midwest that would have followed a collapse of General Motors and Chrysler. The job picture would be far bleaker if he adopted the Republican party’s prescription of letting these companies fail. Dickinson does not dwell too much on foreign policy (but he does raise some of the points below) where a lot of Obama’s accomplishments have been in tone more than substance. But he has managed to bring Russia and China on board for sanctions on Iran and has stayed away from the pointless neo-con drumbeat for war. The irritants from Caracas to Tehran have had a harder time rallying anti-American sentiments against the Obama administration. The lack of substance unfortunately reflects the limitations of American power compounded by Israeli intransigence (aided by their allies here) and Palestinian weakness. Much more needs to be done (notably sensible immigration reform grounded in reality). But the man mocked as an inexperienced community organizer has accomplished a lot with relatively little public infighting within his administration. These are accomplishments the Republicans will have a hard time rolling back. They will loudly proclaim their opposition to tax cuts of any kind. Tax cuts are evidently always job killers, even though the economy did just fine at the Clinton tax rates. They will support tax cuts as a way to magically raise revenue, facts be damned. They will also deny that the Bush tax cuts helped balloon the deficit. The budget deficit (state or federal) will be somehow be eliminated solely by cutting spending. However, they will not spell out what spending will actually be cut. Fiscal Year 2009 U.S. Federal Spending Projections- Cash or Budget Basis. Defense spending is evidently sacrosanct, even though nobody can explain why we need to spend about 40% of the world’s military spending. A few like Paul Ryan will come up with a plan to reform Medicare by essentially not paying medical bills, a plan that has no chance of passing. Most will not specify exactly what they will cut. Social Security is sometimes a target for privatization or raising the eligibility age. Yet again few candidates will risk the wrath of older voters (who actually vote) by offering specifics. It is a separate issue that the problem with Social Security is not the program itself, but the government’s tendency to use the money for other reasons. Most of the ire is focused on the relatively minor amount of discretionary spending (and it will not be possible to eliminate ALL of it), the few billion dollars of stimulus spending which will make no dent on a trillion dollar deficit and items like TARP (which after all the brouhaha will be a fairly small charge (if any) on the Treasury). They will likely be Blue Dog Democrats like Evan Bayh and Blanche Lincoln, Republicans or self professed tea party members. Illinois Republican candidate for Governor Bill Brady who plans to miraculously eliminate the Illinois budget deficit by undefined and fuzzy budget cuts and no tax increases. California Republican Senate candidate Carly Fiorina who frustrated one of the few journalists on Fox News by refusing to answer what exactly cut. California Republican candidate for Governor Meg Whitman whose math for solving the Golden State’s budget problems are as fuzzy as Bill Brady. And just for giggles a compilation of Republicans (including John Boehner and Jeff Sessions) who cannot identify any concrete spending cuts to fix the deficit. All you get is a dose of blather that they will magically fix the problem. So there is one final characteristic of a deficit peacock….a lot of hot air. UPDATE: Missed another one, Washington Republican Senate candidate Dino Rossi who dances around the question of concrete spending cuts to make up for his desire to provide tax cuts at the top of the income chain. Illinois Green Party candidate Rich Whitney who will likely draw a sizable protest vote may show up as “Rich Whitey” on some electronic voting machines. 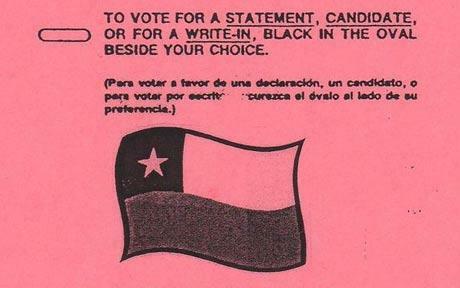 Absentee voters in Atascosa County, Texas may be puzzled to discover that their ballot designers think that the county lies within Chile. In the aftermath of the Reggie Bush scandal that cost him the Heisman trophy and placed USC on probation, Alabama head coach Nick Saban bloviated about the “evil” agents victimizing his players and even called them pimps (wonder what a football coach who makes millions of dollars while steering his unpaid players to basket weaving degrees should be called). The head coach of a school in Austin started politicking (unsuccessfully) for Bush’s revoked Heisman to be returned to his own former quarterback, Vince Young, who was the runner up to Bush. This lends credit to a laughable assertion by college sports coaches today, that their own players are clean. Bush’s primary sin was the brazenness with which he got paid. Yet a simple perusal of the cars that star players drive around campus should end that delusion. Former agent Josh Luchs ripped back the veil on this issue this week by asserting that he repeatedly paid players (and so did other agents) during his career. College football and basketball are major cash cows for the TV networks, colleges and coaches. The NFL, NBA (and even the WNBA) get a free minor league system. Yet the indentured servants who make it all happen do not get paid and cannot even profit from their own likenesses, as Georgia wide receiver A. J. Green discovered this year. Coaches often steer them into majors that do not have any career value. They cannot transfer without sitting out for a year (no such restriction on coaches). Coaches can strip their scholarships for any reason and at any time (this most frequently happens when coaches oversign prospects or desperate assholes like Steve Spurrier try to make room on their roster, while Alabama’s shady Nick Saban puts healthy players on medical scholarships – most of these examples are from the Southeastern Conference for a reason). The system stinks. A more honest system would pay these players or tell the NFL or the NBA to create true minor leagues and stop discriminating against 18 year olds – who can drive, go to war, vote and work in almost every other profession but cannot be drafted by these leagues (the NFL rule requires players to have passed 3 years since high school, so unless you are Doogie Howser an 18 year old cannot be drafted). Somehow I doubt that the well being of players will trump all the vested interests in their way. The fraud of amateur sports will be around for a long time. Hwang Jang-yop the highest ranked defector from North Korea died this week. The death of an 87 year old should not be a surprise, but the timing of his death and the repeated attempts by North Korea to assassinate him have spawned conspiracy theories. His death also highlights the internal divide in South Korea. The conservative parties had no reservations honoring Hwang Jang-yop. South Korea’s leftists, always eager to make excuses for Pyongyang, have been much more lukewarm. The much ballyhooed Sunshine Policy that earned former South Korean president Kim Dae Jung the 2000 Nobel peace price has been a dismal failure. North Korea never had any intention of changing its ways and the policy may have actually propped up Kim Jong Il’s ramshackle regime. Yet South Korea’s leftists place the blame for the recent freeze across the 38th parallel solely on their own government (and the Americans) with no blame attached to the dictator across the border – even when he sinks a South Korean naval vessel and kills South Korean sailors. The presidency of Roo Moo-hyn (who committed suicide last year) saw Seoul turn a blind eye to North Korean spy infiltration. At times you have to wonder if these parties are really that naive or are actually Manchurian candidates taking orders from Pyongyang (just as many Indians often cynically joke about their own communists taking orders from Beijing). It is a rule people would do well to remember. If you want things to be private (a) don’t commit it to paper, (b) don’t type it up on your computer and (c) never, ever email it to friends relying on their good judgment.